Part of the fun of living in Washington State at this point in time is the near continuous joy of discovery. While grapes such as Riesling, Merlot, and Cabernet Sauvignon have a relatively long history in the state, new varieties are being continually being planted. Part of this is due to a desire to experiment on the part of growers and winemakers. Part of it is the search for Washington's "signature grape" - the variety that grows both uniquely well and distinctively here. One of Washington's boons and banes as a wine growing region is that so many varieties grow so well here - The Perfect Climate for Wine as the Washington Wine Commission's moniker says. With the seeming exception of Pinot Noir, almost all of the varieties that have been planted in Washington have thrived. A number of winemakers, perhaps most notably Doug McCrea at McCrea Cellars, have continually pushed the boundaries introducing new varieties to the state (most recently in McCrea's case Picpoul and Grenache Blanc). 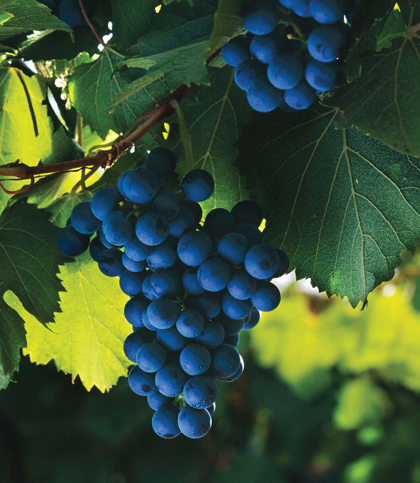 There has been a profusion of varieties recently in Washington vineyards, with many having twenty to twenty-five different grape varieties planted. One of the varieties that has garnered the most attention in Washington of late is Malbec. Malbec is one of the original Bordeaux varieties. While now uncommon in Bordeaux, it has developed a stronghold in Argentina. Washington's experience with the grape is relatively short, about twenty years. However, in the last five years winemakers and growers have become increasingly excited about the grape. Seattle Magazine named Malbec as "best emerging varietal" in its 2009 Washington Wine Awards. At the beginning of this year, Paul Gregutt, writing for the Seattle Times, said his bet is on Malbec as Washington's next big grape. Indeed, Malbec seems to grow both well and distinctively in Washington. The number of bottlings is still relatively limited and production is small. However, there are a many exciting examples, such as wines from aMaurice, William Church, Saviah Cellars, and Walla Walla Vintners to name just a small handful of a growing list. Unfortunately, many of these wines don't make it out of the tasting room due to limited production. Many local wine stores stock only two or three examples from the state (Seattle's Esquin is a notable exception with a section devoted to Washington Malbec that contains almost twenty wines). This Saturday at the Taste Washington educational day, a seminar titled Mighty Malbec will focus on the recent excitement about this grape. I will be one of the panelists where we will taste Malbec from France, Argentina, and Washington. There are many reasons why I am excited about this grape, but I would be interested to hear your thoughts. For growers, have you seen any increased demand for the grape or have you increased your plantings? For wineries who are currently producing Malbec, what has been your experience both in terms of the resulting wine and the consumer response? For wineries not currently producing Malbec, have you been considering it? For consumers, what is your perception of this variety and how the wines here compare to other regions around the world? Where will Malbec go in Washington? Only time will tell and other grapes are already vying for to be Washington's next emerging variety. Part of what makes living here so much fun. I look forward to your talk at Taste Washington. I don't have a ton of experience with Malbec. It'll be fun to see how it evolves in the state. With Washington leading the way, and at least 10 other states-Oregon, New York, Colorado, Missouri, Texas, etc, I'd say Malbec is becoming the grape to watch. I'd like to know Sean how you will find the aspects of French, Argentine, and Washington Malbec's. I've only had Washington, Argentine and Chilean Malbec. The QPR for the South American wines were high I thought. I was actually surprised when I opened up a bottle from Washington after a Argentine Malbec. It held up well and actually got better reviews from our company. I was pissed. The Washington Malbec was 3 times the price! Live and learn. Cityroute16, you've actually hit the nail on the head of the grape's problem in Washington at the moment. $15 often buys you a very enjoyable bottle of Argentinian Malbec. In Washington, $15 isn't going to get you any Malbec - unless it's on sale. Bottles start about $20, with many in the high twenties and thirties. If you look at a comparably priced bottle of Argentinian wine, the Washington wine is going to have some steep competition. These are really enjoyable wines but the pricing which is related to small amount of planting and limited production is an issue. Especially in a down economy. Mighty Malbec. There's a lot to be said about a lot of varieties being grown in WA today... I'm often asked in the marketplace, "What will WA be known for?" I often reply, "WA will be known for world-class wines. Wines that have a sense of place, offer tremendous value (even at $30-$40), and are balanced with old world versus new world character. No one variety just'variety'." If the person isn't staring blankly at me by this point I realize that they have begun to understand the WA wine phenomenon -- a lot of great boutique, artisan producers crafting wines of distinction without "rules". At Dusted Valley we've been producing varietal malbec since our second vintage in 2004 (25 cases). Today, we bottle around 125-150 cases, and love the cherry fruit and fleshy mouthfeel the grape brings to the bottling. Malbec almost always seems to find a way into our bordeaux style blends as well. Remaining consistent with the comment above, we've also been bottling varietal cab franc and soon, petit verdot in addition to the main-stream cab sauv and merlot blends. It's a ton of fun to share these wines with wine drinkers as they continue to discover the unique opportunity Washington affords all of us wine peeps! That's what it's all about. Explore! Corey, thanks for the comment. Indeed, we have an embarrassment of riches in Washington. It offers some consumer confusion potentially outside the state in that the area can't be pigeon-holed the way Napa or Oregon or other areas can. However, as you say, over time this may build into a consumer impression of world-class wines with high QPR. While Wine Spectator's naming the Columbia Crest wine its Wine of the Year last year was controversial with some, I think it probably advanced the ball forward quite a bit in this regard. We've been making varietal Malbec since 2006 in small lots (100 to 125 cases. As mentioned most of this gets sold directly out of the winery. People love how approachable the wine is, the uniqueness of the flavor profile and the fact it easily pairs with lots of hefty red wine foods. Even a couple years ago this wine was relegated to the "other varietal" section of most wine shops. And now...front page articles in national magazines and whole categories in tastings and judging events. Who knew? I agree Washington does so many varietals well but I think Washington Malbec will distinguish itself with that special characteristic found in Washington displaying the best of the old world and the new world. The price will invariably come down over time but we will still treat it as a very special niche wine for us. Why was malbec's price per ton the most expensive last year? Was it "perceived" demand for a small crop? A chance to "hop" onto a trendy grape? If Bourdeaux (not Cahors) relegated malbec to the status of carmenere, what does that say about the grape's chances as a stand-alone varietal? I have recently tasted a wonderful (and aged) William Church '06 malbec that set me back $90/3 btls and I thought it was a good deal. Then, I tried a $20 Catena malbec (high-elevation Argentina) and even I flew the white flag, as much as I advocate Washington wines. Leslie, it is interesting to see how quickly things can change here as Malbec was barely on the radar screen a few years ago. I do believe the prices will come down, or at least that there will be more $15-$20 offerings as the plantings increase. Thanks for the comment. WWM, I think this is somewhat of an issue for Washington wines more generally frankly. On the one hand, if you compare the high quality of the Syrah, for example, being produced in Washington, they are price competitive with wines coming from, say, California of a similar quality. However, lots of pretty good quality French and Aussie juice (not talking about the fruit bombs here) for cheaper prices. Different wines and styles obviously but still. Tough to compete nationally or internationally with a two for one price. I believe there will always be a significant place for wines $30,$40 dollars and above given their quality obviously. However, I do think we need more medium to high quality mid-priced offerings to be able to enter different markets more successfully. Watch out Malbec, Grenache is fast on your heels. Tempranillo has decided to enter the competition as well. One question that several people I have talked to about Malbec have asked is "Do you think it will become another Syrah?" By this, they mean a critically acclaimed variety in Washington that many have a difficult time selling (and many do not I should add). Good questions. Watermill Winery in Walla Walla AVA is producing a bodacious estate malbec. Unfortunately, you won't be able to experience at Taste WA -- the winery is located in Milton Freewater, about two miles south of the WA-OR state line. Bob, was just spying the Watermill offering in a shelf the other day. Indeed, an interesting potential problem in the making with a number of Walla Walla Valley wineries located in Oregon and using grapes from Oregon WWV AVA vineyards. Folks on Twitter have also mentioned Malbec from Saviah Cellars, Fidelitas, and aMaurice as among their favorites. Taste Washington (State or AVAs, wineries or grapes)? How should they discriminate? I'm still looking for that Hong Kong winery that imported Washington State grapes. Would they be invited?